No matter how seemingly dull a hill might initially appear, the more I investigate my local 100 list, the more I expect a second visit to be made to many. Dunmurry Hill could be one such hill. Really? A simple tarmac road to follow beside fields filled with grazing cattle, a trig pillar and a mast. No challenge, isolated, and hard to make any sort of walk out of. A quick hill-bag and home. Ticked off the list last February - forgotten again. And yet. A little further investigation suggests there is more to this place. I came across a name - the Chair of Kildare. Intriguing - what is this? Firstly it is a mound, lying just north east of Dunmurry Hill, on Grange Hill (which itself doesn't meet the MV prominence criteria), at N71979 17307 A. This is marked on the OS. The mound is something of a curiosity, an antiquity on top of a rocky outcrop, what with rocky outcrops being quite unusual for the area. The geological analysis from 1858 suggests it is a natural protrusion of various older rocks including old red sandstone above the main body of upper limestone that covers the area. It suggests that the Old Red sandstone derives from a prehistoric time when these little hills stood like islands surrounded by sea against which sand washed up on the shore, if you can fathom that. 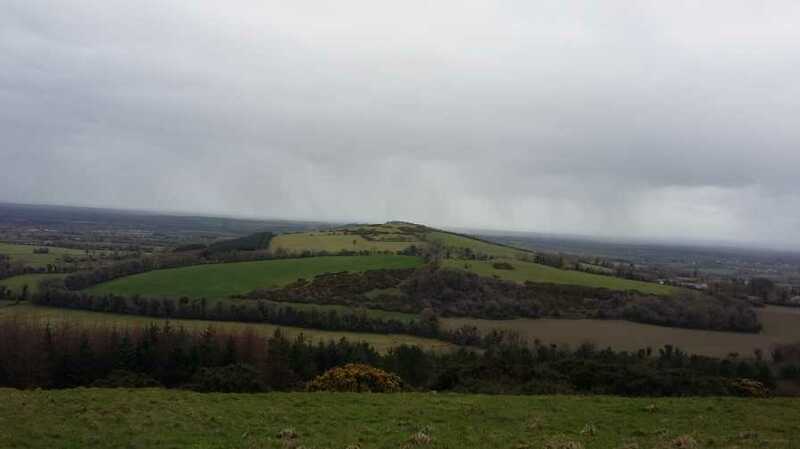 Secondly, it was taken on as the name for this small low lying range of hills including Dunmurry and the Hill of Allen to the North of Kildare town. This is quoted in many places, including the Geological Survey of Ireland of 1858, and some modern day references. Dividing the Chair range, a marshy valley between Grange Hill and the Hill of Allen serves as a feeder for the grand canal. The folklore is also rich. There is an account of a fairy-woman, or a witch, Moll Anthony, living at the Chair in the 1800s, who had special healing powers. There is enough in the ether to suggest there was genuine belief in her abilities! Has she a cure for curiosity?